December 30, 2018 – January 5, 2019. 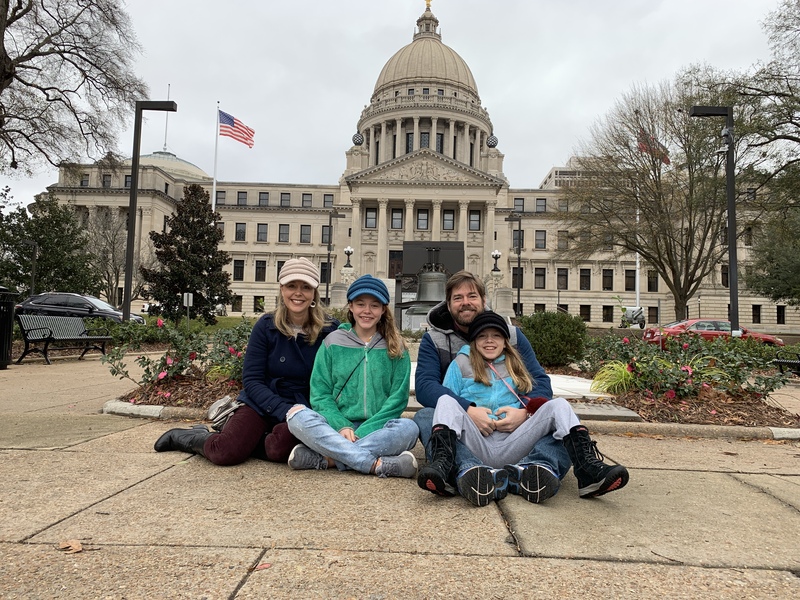 6 nights in Jackson, MS.
We are mainly here as a stopping point on our way to Huntsville, AL but we’d also plan to visit the capitol building and Vicksburg Battlefield. We stayed at Timberlake Campground which was right on a lake. The sites are not level so we had a had to move the RV around a bit to get the smallest slope. The sites on the lake for for monthly renters so we were close to the road. We did enjoy riding our bikes over to the public park next door. We did some geocaching there and worked out on the gym equipment. We found a family friendly New Year’s Eve event at the Mississippi Museum of Natural Science that sounded fun. It was a Glow In the Dark party. It turned out to the a bit of a dud but we came home afterward and had our own dance party. The museum part was open so we explored that and took a night hike that was lined with glow sticks and balloons. We did enjoy the cupcakes, punch and balloon drop. Check out the two headed snake pictured below. The Mississippi Capitol building, built in 1903, is modeled after our nation’s capitol building. One of the 53 replicas of the original Liberty Bell, as well as a statue erected in memory of the ladies, mothers, sisters, wives and daughters of the Confederate soldiers is located on the capitol grounds. We took a self guided tour of the inside. We were struck by the lighting in this building, it is different than any of the capitol’s we have visited. They had movie theater sign lights around all the arches and niches. The lighting throughout provided a warm soft glow that was cozy contrasted to the stark bright that we usually experience. Did you know that the author John Grisham served two terms in the House of Representatives and this is where he began writing? Old Capitol Museum is housed in the Old Mississippi Capitol building where it served as the Mississippi statehouse from 1839 until 1903. Andrew Jackson, Henry Clay and Jefferson Davis spoke here. The visit to this museum is free and gives the history of the building. Hurricane Katrina severally damaged it in 2005, but it was repaired and reopened in 2009. Vicksburg National Military Park is an hour from Jackson, MS so we called ahead to see if you could drive through the park even though we are on a government shut down. We did learn that the Friends of the Park are funding the staff so it can remain open. From the National Park service’s website, “Confederate President Jefferson Davis remarked, “Vicksburg is the nailhead that holds the South’s two halves together.” At the start of the Civil War, Confederates controlled the Mississippi River south of Cairo, Illinois all the way to the Gulf of Mexico. With it’s valuable commercial port and railroad hub, the city was of tremendous importance. From points west of the Mississippi River, men, food, salt, and weapons, funneled through Mexico, made their way to Vicksburg and Confederate armies in the East. The visitor center has a 20 minute film and a small museum that recounts the timeline of the battle of Vicksburg. After visiting the museum we drove the 16 mile loop of the battlefield. There are 1,300 monuments, tablets, and markers, commemorating the sacfrifies of the battle. This military park has earned the title of The largest Outdooor Art Gallery in the World. USS Cario is located at the end of the loop and is a must see. Inside the museum you learn that she was sunk in 12 minutes but no lives were lost. You can also watch a film about how they recovered the ship from the muddy Mississippi. The girls earned another junior ranger badge. When we went shopping for our 80’s fluorescent fashions for the glow party we found a Menchie’s! It rained most of the week so we found a nice library to work out of. We visited Vicksburg two years ago. Fascinating, especially the USS Cairo. Here’s a tip if you ever visit Gettysburg. You can hire a licensed docent to ride with you in your car and give you a private tour. It’s inexpensive and you learn much more than if you go it alone. That’s a great tip! Thank you. I had no idea and I’m glad to hear they do that. We will visit Gettysburg this year. I agree with you that the USS Cairo is fascinating. Thanks for reading.